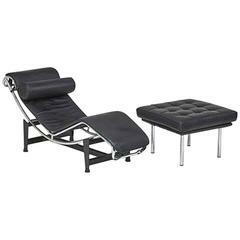 The Omnibus chaise lounge by Vladimir Kagan in COM / COL. USA, circa 1980. 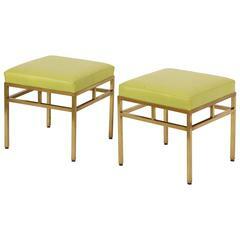 Features upholstered seat with signature Lucite base. Price includes Labor / custom reupholstery in Client's Own Material (COM) or Client's Own Leather (COL). Please allow 4 to 6 weeks for reupholstery; 10 yards of fabric required. Alternatively, buyer may choose to retain the original fabric; a black and off-white/cream zebra velvet in good condition with light wear. Dimensions: Length 84 inches Depth 32 inches Height 28 inches Seat height 16.5 inches. Price includes custom re-upholstery (labor) in fabric to be provided by buyer. Upon re-upholstery, item will be like new. Existing original fabric is in good condition with light wear but very usable. Vladimir Kagan omnibus sofa. Floating L shape sofa with recessed Lucite supports. Additional pieces available. Vladimir Kagan omnibus angled floating sofa on recessed Lucite supports. Vladimir Kagan Cloud sofa. Purple in color. Photos were taken in different lighting conditions, so are showing differently in color, because of it. Lighter was in sunlight. 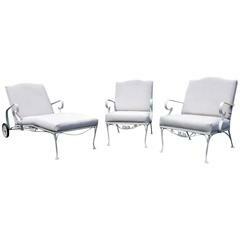 Rare and large chaise lounge produced in Sweden. A spectacular “Corkscrew” chaise lounge. The chaise is upholstered in a blue knoll fabric. Dimensions: 30” high, 64” wide, 38” deep.